While currently best known to these shores for being the one footballing nation we're able to beat in a major international competition, Slovenia is also the homeland of producer Sare Havicek. This album is a showcase for Havlicek's mastery of '70s and '80s cosmic disco stylings, calling upon a prodigious arsenal of analogue synthesizers for its every oscillation. The press release reassures that Toscana Nights was fully realised without the assistance of samples or loops, and it sounds quite splendid as a result. At every turn you'll encounter potent dancefloor munitions, from the opening title track through to the immense 'Dancing In Val D'Isere 1979', with one or two vocally-assisted excursions thrown in along the way such as the guitar-twanging Euro-raunch of 'White Russian' and the ace 'Pleasure Storm', fronted by Hannah Mancini. 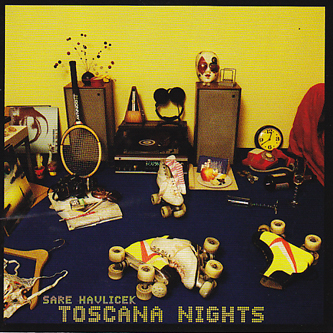 Toscana Nights is a lot of fun, but it's also a very finely produced affair, comparable to the sort of sounds emanating from the studios of Nordic maestros like Prins Thomas and Diskjokke, but with a more purely retro sound that belies an even greater reverence for disco's bygone heyday.